Dame Agatha Christie, dubbed the "Queen of Crime" for leaving an overwhelmingly successful and influential body of work including eighty detective novels has been long valued as "one of the most important and innovative writers in the development of the [mystery] genre." With "only the Bible... known to have outsold her collected sales of roughly four billion copies of novels," and a global readership which can pick up her work in any of the more than fifty-six languages in which they've been translated, it's no wonder that time and time again Christie's ingeniously crafted tales of murder and mayhem have been adapted to stage and screen. 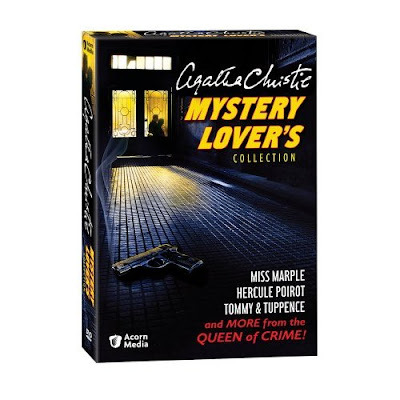 With the October 28th release of Acorn Media's beautifully packaged boxed set, Agatha Christie: Mystery Lover's Collection, we're presented with five timeless mysteries spread over four DVDs and including some of her most cherished characters such as Hercule Poirot, Miss Jane Marple, and Tommy & Tuppence. With David Suchet's impeccable portrayal of Hercule Poirot, we're introduced to a made-for-British-television adaptation of Agatha Christie's very first published novel which introduced the Belgian police detective to readers in The Mysterious Affair at Styles. Although her diaries would reveal that Christie found Poirot "insufferable," and in later years dubbed him "an ego-centric creep," she shared that he could never have been written alongside her preferred Miss Marple since Poirot "would not like being taught his business or having suggestions made to him by an elderly spinster lady." Nonetheless Poirot was her most popular character, appearing in more books than any other and holding the auspicious honor of being "the only fictional character to have been given an obituary in The New York Times... in 1975." While the film adaptation of Styles is of interest for its sheer historical and literary importance in depicting Christie's first foray into the world of writing, perhaps its shortcomings lie in the novel itself, as onscreen far too many characters are introduced much too quickly, easily confusing viewers from the start. However, much like Marlowe in the equally impossible to follow adaptation of Raymond Chandler's The Big Sleep, the plot takes a backseat and it's Poirot's show all the way. However, Christie's love for Miss Jane Marple shines through in the wonderful reinterpretation albeit a loose adaptation of The Body in the Library which is also included in the set. Featuring an extraordinary cast including Tara Fitzgerald and Geraldine McEwan as Miss Marple, we follow a mysterious case involving a beautiful blonde woman discovered dead in the library of the home of Marple's dear friend, Dolly Bantry. With no idea just who the woman is or how she came to be in the library, Marple and Dolly conduct their own investigation alongside the official police one as they journey to the seaside to gain greater access to the posh hotel she worked at as a dance hostess. With quite a surprising finale and several twists and turns throughout, it's a standout in the set and one you may have to view twice to pick up on all of the clever clues, red herrings and nuances throughout. However, my greatest surprise was upon the discovery of the delightful Partners in Crime, detective couple Tommy & Tuppence. In the feature length, screwball inspired mystery The Secret Adversary which was my favorite in the entire set, we're introduced to the young, ambitious characters who reunite after the end of the first World War and by chance find themselves quickly embroiled in a major political mystery. With superb chemistry between the leads played by James Warwick and Francesca Annis and a wonderful script, it's a treasured find for those readers, such as myself, who were mostly preoccupied with Marple and Poirot. Unfortunately, the follow-up mystery on the disc, The Affair of the Pink Pearl which was made as part of the short-lived British television series Partners in Crime finds our brave and hilarious duo relegated to a life of the idle rich in an overly staged and cringe-worthy production that's best to be skipped in favor of a second viewing of The Secret Adversary. Rounding out the set is the A&E version of Christie's suspenseful Macbeth-tinged mystery, The Pale Horse. Set in the swinging 60's of London with the appropriate Kinks heavy soundtrack included for good measure, this chilling tale of black magic and mayhem seems more Buffy the Vampire Slayer than quintessential Christie. However, soon our likable lead Mark Easterbrook (Colin Buchanan) finds himself as the Hitchcockian wrong man when he stumbles upon the body of a dying priest whose fingers are clutching a secret list of names. With the sculptor and artist Mark on the case along with his two friends (played by Hermione Norris and Jayne Ashbourne), Mark must get to the bottom of the case before more terrifying events begin spiraling out of control. Eerie, sinister and perfectly timed in its release just before Halloween-- it wasn't as entertaining as The Body in the Library or The Secret Adversary but served as a swiftly paced and unexpected inclusion for Christie devotees. Packaged together for the first time, these BBC, Granada, PBS and A&E mysteries make a great introduction to the world of Christie for newcomers as well as a set that rewards those who've been reading her books for years. And in the case of this reviewer, it may even make you seek out more Acorn Media packaged adaptations featuring the stars involved (like the excellent new Miss Marple portrayed by Geraldine McEwan) or pick up a few novels chronicling the adventures of Tommy & Tuppence. Agatha Christie: Mystery Lover's Collection will be available from Acorn and online via select retailers such as Amazon on October 28.